Women diagnosed as having invasive breast cancer at Kaiser Permanente Northwest Center for Health Research (Oregon) (1990-2008) or Kaiser Permanente Institute for Health Research (Colorado) (1994-2008) were followed up until the earliest of the following events: contralateral breast cancer (CBC) diagnosis, other second cancer diagnosis, exiting the Kaiser Permanente health care plan, death, last tumor registry follow-up, or end of the study (December 31, 2010, for Kaiser Permanente Northwest Center for Health Research [Oregon] or December 31, 2011, for Kaiser Permanente Institute for Health Research [Colorado]). The numbers of contralateral breast cancer cases in each treatment group and adjustment factors included in this multivariable model are listed in eTable 3 in the Supplement. The data were adjusted for competing risks by tamoxifen therapy and duration among 3732 women who survived 5 or more years after being diagnosed as having an estrogen receptor–positive initial breast cancer. Curtis RE, Ron E, Hankey BF, Hoover RN. New malignancies following breast cancer. In: Curtis RE, Freedman DM, Ron E, et al, eds. New Malignancies Among Cancer Survivors: SEER Cancer Registries, 1973-2000. Bethesda, MD: National Cancer Institute; 2006. NIH publication 05-5302. Epicure [Computer program]. Version 2.10. Seattle, WA: HiroSoft International Corp; 1998. Question What is the association between adjuvant tamoxifen citrate and aromatase inhibitor therapy and contralateral breast cancer (CBC) risk within a general community setting? Findings In this cohort study of 7541 patients with invasive breast cancer in a general community health care plan, tamoxifen therapy was significantly associated with reduced CBC risk during treatment, and risk decreased as tamoxifen therapy duration increased. Protective associations persisted at least 5 years after stopping tamoxifen therapy, and aromatase inhibitor use without tamoxifen therapy was associated with reduced CBC risk. Meaning If adjuvant endocrine therapy is indicated for breast cancer treatment, women should be encouraged to complete the full course. Importance Within 10 years after breast cancer diagnosis, roughly 5% of patients develop contralateral breast cancer (CBC). Randomized trials have found that therapy including tamoxifen citrate and aromatase inhibitors (AIs) reduces CBC risk. But little is known about the magnitude and duration of protective associations within the context of real-world clinical management settings, where varying durations of and gaps in treatment are common. Objective To determine the association between adjuvant tamoxifen and AI therapy and CBC risk within a general community setting. Design, Setting, and Participants A retrospective cohort study of CBC risk among 7541 patients diagnosed with a first primary unilateral invasive breast cancer at Kaiser Permanente Institute for Health Research (Colorado) or Kaiser Permanente Northwest Center for Health Research (Oregon) between January 1, 1990, and December 31, 2008. Data were analyzed from 1 year after diagnosis of the first breast cancer through the earliest of the following events: CBC diagnosis, other second cancer diagnosis, death, last tumor registry follow-up, exit from the Kaiser Permanente health care plan, or end of study follow-up (December 31, 2010, for Oregon and December 31, 2011, for Colorado). Exposures Adjuvant tamoxifen use and AI therapy were treated as time-dependent exposures, assessed using electronic prescription records. Main Outcomes and Measures Incident CBC based on long-term systematic follow-up. Results Among 7541 women with invasive breast cancer, median age at initial breast cancer diagnosis was 60.6 years (age range, 24.9-84.9 years). Women were predominantly (92.9% [7009 of 7541]) of white race. During a median of 6.3 years (range, 1-20.9 years) of follow-up, 248 women developed CBC (45 in situ and 203 invasive). Contralateral breast cancer risk decreased significantly with increasing tamoxifen therapy duration. In current users, the relative risk (RR) per year of tamoxifen use was 0.76 (95% CI, 0.64-0.89), with an estimated 66% (RR, 0.34; 95% CI, 0.29-0.40) RR reduction for 4 years of use compared with nonusers. Risk reductions were slightly smaller for past users but were still significant at least 5 years after stopping tamoxifen therapy (RR per year of use, 0.85; 95% CI, 0.71-0.995). In addition, AI use without tamoxifen therapy was associated with reduced CBC risk (RR for AI users compared with nonusers, 0.48; 95% CI, 0.22-0.97). Risk reductions were most apparent among women whose primary and CBCs were estrogen receptor positive. Conclusions and Relevance Tamoxifen therapy was associated with reduced CBC risk during treatment and after its cessation, with risk progressively decreasing as tamoxifen therapy duration increased. Among those surviving at least 5 years, tamoxifen use for at least 4 years was estimated to prevent 3 CBCs per 100 women by 10 years after an estrogen receptor–positive first breast cancer, an absolute risk reduction that is consistent with findings from clinical trials. If adjuvant endocrine therapy is indicated for breast cancer treatment, these findings in concert with trial data suggest that women should be encouraged to complete the full course. Despite strong evidence from trials, little is known about the magnitude and duration of protective associations within real-world treatment scenarios, where varying durations of and gaps in treatment are common. Observational studies7-17 have reported marked reductions in CBC risk with use of tamoxifen or other unspecified endocrine therapies; however, most studies7-12,14-17 have not directly examined therapy duration and the persistence of effects. Furthermore, observational studies9,12 have offered conflicting evidence as to whether associations differ according to the ER status of the CBC, and none have reported on the association between AI therapy and CBC risk. We undertook an investigation of the association of adjuvant tamoxifen therapy and AI use with CBC risk in a cohort of women diagnosed as having invasive breast cancer within the Kaiser Permanente health care plan. This setting offers several advantages for studying these associations, including long-term systematic follow-up of a large number of patients with breast cancer with electronic prescription records, facilitating characterization of the persistence of associations of varying treatment durations, accounting for treatment gaps. We developed a retrospective cohort of patients (n = 8308) diagnosed as having a first primary unilateral invasive breast cancer at Kaiser Permanente Northwest Center for Health Research (Oregon) (4665 between January 1, 1990, and December 31, 2008) or Kaiser Permanente Institute for Health Research (Colorado) (3643 between January 1, 1994, and December 31, 2008) who survived and remained at CBC risk for at least 1 year. Data were analyzed from 1 year after diagnosis of the first breast cancer through the earliest of the following events: CBC diagnosis, other second cancer diagnosis, death, last tumor registry follow-up, exit from the Kaiser Permanente health care plan, or end of the study follow-up (December 31, 2010, for Kaiser Permanente Northwest Center for Health Research and December 31, 2011, for Kaiser Permanente Institute for Health Research) (Figure 1). We excluded 342 patients with contralateral breast removal at the initial surgery, 125 patients initially diagnosed as having metastatic disease, 98 patients not treated with breast surgery, and 202 patients diagnosed at 85 years or older, resulting in an analytic cohort of 7541 patients. This study was approved by the National Cancer Institute Special Studies Institutional Review Board and by the Research Subjects Protection Office of Kaiser Permanente Northwest Center for Health Research (Oregon) and the Institutional Review Board of Kaiser Permanente Institute for Health Research (Colorado). A waiver of written informed consent by these same Oregon and Colorado institutional review boards was granted based on the minimal risk of this linkage-based research. Treatment with tamoxifen, AIs, other hormonal agents, chemotherapeutic agents, and radiotherapy was obtained from electronic Kaiser Permanente prescription and medical records. Treatment courses were defined separately for tamoxifen and AIs and consisted of therapy without a gap in prescription coverage of at least 90 days. Women were considered users of adjuvant endocrine therapy if they had accumulated at least 90 days of therapy during any one treatment course after the first primary cancer diagnosis. Because of the recent introduction of AI therapy in this cohort, we assessed ever use but could not yet evaluate its recency or duration. Current tamoxifen use was defined as tamoxifen therapy within the past 30 days, whereas former use was defined as at least 30 days. Time since the last tamoxifen use was calculated from the end of the last tamoxifen course during the follow-up period, and 15.4% (601 of 3900) of patients treated with tamoxifen had at least 2 courses. Patient and clinical characteristics, including race, height, weight (available after 1996 at Kaiser Permanente Northwest Center for Health Research [Oregon] and after 2000 at Kaiser Permanente Institute for Health Research [Colorado]), and tumor characteristics, were obtained from electronic medical records. Measured height and weight were used to calculate body mass index. Second cancer diagnoses and vital status were determined from the Kaiser Permanente Tumor Registry. We used multivariable Poisson regression models to estimate relative risks (RRs) and 95% CIs for CBC risk associated with endocrine therapy. Study entry was 1 year after diagnosis of the first breast cancer, and person-years accrued until the earliest of the following events: CBC diagnosis, other second cancer diagnosis, death, last tumor registry follow-up, exit from the Kaiser Permanente health care plan, or end of the study follow-up (December 31, 2010, for Kaiser Permanente Northwest Center for Health Research [Oregon] and December 31, 2011, for Kaiser Permanente Institute for Health Research [Colorado]). Adjuvant tamoxifen use and AI therapy were treated as time-dependent exposures, assessed using electronic prescription records. We evaluated risk in relation to a combination of tamoxifen therapy duration in years (continuous variable for log linear trend) and time since the last use (ie, current use and former use, with <3 years, 3 to <5 years, and ≥5 years since the last use), with the reference group defined as those who had never used tamoxifen or used tamoxifen for less than 90 days. Among former tamoxifen users, we also assessed risk in relation to categories of tamoxifen therapy duration of 90 days to less than 1 year, 1 year to less than 4 years, and at least 4 years using cut points based on the cohort distribution of the cumulative tamoxifen exposure. Sensitivity analyses evaluating CBC risk associated with the first tamoxifen course yielded similar results. Poisson regression models were stratified by covariates that we had identified a priori, including study site, age (<40, 40-49, 50-59, 60-69, or ≥70 years) and American Joint Committee on Cancer stage (I, II, III, or unknown) at diagnosis, ER status of the initial tumor (positive, negative, or unknown or indeterminate), time since the initial breast cancer in yearly categories up to 15 years or more, and, to account for potential cohort effects, diagnosis year (1990-1994, 1995-1999, 2000-2004, or 2005-2008). We also adjusted models simultaneously for AI use (with or without tamoxifen therapy), chemotherapy with an alkylating agent, and radiotherapy. Because body mass index was not associated with tamoxifen therapy duration, it was not used in the adjustments. The median age of the cohort at the initial breast cancer diagnosis was 60.6 years (age range, 24.9-84.9 years). Women were predominantly (92.9% [7009 of 7541]) of white race (eTable 1 in the Supplement). During a median of 6.3 years (range, 1.0-20.9 years) of follow-up, 248 women developed CBC (45 in situ and 203 invasive). Compared with women who did not develop CBC, CBC cases had similar initial breast cancer stage, grade, histologic findings, and ER status. Almost 70% (5083 of 7541) of CBC cases and noncases were prescribed radiotherapy, and approximately one-third (2527 of 7541) were prescribed chemotherapy with an alkylating agent for the initial treatment. However, during study follow-up, CBC cases were less likely to have been treated with endocrine therapy compared with noncases (51.2% [127 of 248] vs 65.3% [4762 of 7293]). Compared with nonusers, tamoxifen users were slightly more likely to be of white race (94.7% [3695 of 3900] vs 91.0% [3314 of 3641]) and younger than 50 years at the initial diagnosis (22.3% [870 of 3900] vs 18.6% [679 of 3641]) (eTable 2 in the Supplement). Tamoxifen users were more likely to have initial diagnoses that were stage II, moderately differentiated grade, and ER positive. In addition, tamoxifen use was less common among women whose primary breast cancer had been diagnosed more recently. Fifty-two percent (3900 of 7541) of patients used tamoxifen, with a median duration of use of 3.3 years (range, 0.3-16.2 years). Contralateral breast cancer risk decreased with increasing tamoxifen therapy duration among current and former users (Figure 2 and eTable 3 in the Supplement). In current users, the RR per year of tamoxifen use was 0.76 (95% CI, 0.64-0.89) (Table), with an estimated 66% (RR, 0.34; 95% CI, 0.29-0.40) RR reduction for 4 years of use compared with nonusers. Risk reductions were slightly smaller for past users but were still significant at least 5 years after stopping tamoxifen therapy (RR per year of use, 0.85; 95% CI, 0.71-0.995). During the course of the study, 1929 patients (25.6%) received AIs (typically anastrozole or less frequently letrozole), with increasing use in more recent periods. Aromatase inhibitors taken with (n = 963) and without (n = 966) tamoxifen were used for median durations of 2.2 years (range, 0.3-10.2 years) and 2.9 years (range, 0.3-9.5 years), respectively. In addition, AI use without tamoxifen therapy was associated with reduced CBC risk (RR for AI users compared with nonusers, 0.48; 95% CI, 0.22-0.97) (10 diagnosed CBC cases) (Table). Our study did not have sufficient statistical power to evaluate these risks in more detail. Among women whose first cancer was ER positive (n = 5951), findings were consistent with those of the overall cohort (Table). Likewise, when considering the ER status of the subsequent CBC, risk of ER-positive CBC decreased significantly with increasing years of tamoxifen therapy duration among current users (RR per year of use, 0.68; 95% CI, 0.54-0.84) and among former users with less than 5 years since the last use compared with nonusers (RR per year of use in those with <3 years since the last use, 0.79; 95% CI, 0.67-0.91 and RR per year of use in those with 3 to <5 years since the last use, 0.83; 95% CI, 0.70-0.98). Among women whose primary cancer was ER positive, 31 were subsequently diagnosed as having ER-negative CBC. Although based on small numbers, there was little indication that tamoxifen therapy reduced ER-negative CBC risk when evaluated using tamoxifen therapy duration or when tamoxifen users were compared with nonusers (RR, 1.06; 95% CI, 0.41-3.10). Among women whose first primary cancer was ER negative (n = 1236), 186 (15.0%) used endocrine therapy, for which no clear associations were observed. Twenty-five of the CBCs were ER positive, and 13 were ER negative. Among patients with a first ER-negative cancer, tamoxifen therapy was not associated with reduced risk even of ER-positive CBC (RR, 1.97; 95% CI, 0.50-6.39) (4 diagnosed CBC cases); however, the numbers of CBCs diagnosed within treatment groups were small. In separate analyses by age at the initial diagnosis, findings among women who were 50 years or older at the initial diagnosis (eTable 4 in the Supplement) were similar to those observed in the overall cohort. Among women whose first breast cancer was diagnosed before age 50 years, risk reductions were similar for current and former users with less than 5 years since the last use but were based on only 53 CBC cases and not statistically significant. Figure 3 shows the estimated cumulative incidence of CBC adjusted for competing risks by tamoxifen use and duration among 3732 women who survived at least 5 years after a diagnosis of ER-positive first breast cancer. Of these patients, 2517 (67.4%) used tamoxifen, with a median duration of use of 4.2 years (range, 0.3-16.2 years). Patients who did not use tamoxifen had a 10-year cumulative incidence of CBC of 4.9% (95% CI, 3.3%-6.5%), whereas the incidence was lower among those taking tamoxifen for less than 4 years (3.3%; 95% CI, 2.1%-4.6%) and was lowest among those taking tamoxifen for at least 4 years (1.6%; 95% CI, 0.9%-2.3%). Among those surviving at least 5 years, tamoxifen use for at least 4 years was estimated to prevent 3 CBCs per 100 women by 10 years after an ER-positive first breast cancer. At 15 years after diagnosis, use of tamoxifen for at least 4 years was estimated to prevent 4 CBCs per 100 women. This retrospective analysis of more than 7500 US patients with invasive breast carcinoma treated in a general community health care plan suggests that adjuvant tamoxifen and AI therapies significantly reduce CBC risk. We have supplemented clinical trial data by testing associations in an unselected group of patients using electronic prescription records to accurately quantify risk reduction in CBC per year of adjuvant tamoxifen use and estimating the persistence of therapeutic effects in analyses, accounting for gaps in therapy and multiple treatment courses. We found that tamoxifen therapy protects against CBC when women are undergoing treatment and after treatment has ceased. Among former users, risk reduction was most apparent for those receiving tamoxifen for at least 4 years, with protective associations persisting during the first 5 years after stopping tamoxifen therapy. These associations were stronger among women whose first primary cancer was ER positive. As we have shown, the persistence of protective associations between adjuvant tamoxifen use and CBC risk likely depends on therapy duration, an issue not sufficiently addressed in prior observational studies.7-12,14-17 In the Women’s Environment, Cancer and Radiation Epidemiology (WECARE) case-control study,7 significant protective effects of tamoxifen therapy on CBC risk persisted for 5 years after diagnosis, although therapy duration was not directly examined. Two nested case-control studies8,9 found that taking tamoxifen for at least 12 months was associated with decreased CBC risk, but the persistence of the effect was not reported. Cohort studies10-17 have demonstrated substantial reductions in CBC risk with tamoxifen or other unspecified endocrine therapies. In the single cohort study13 to have evaluated the persistence of effects in relation to tamoxifen therapy duration, no clear patterns emerged: that Danish study found that current but not former adjuvant tamoxifen therapy was associated with reduced CBC risk. The lack of effect among former users could be due to shorter tamoxifen therapy duration (median, 1.0-2.5 years) in that study relative to our US patient population. In contrast, findings from our observational study are consistent with a 2011 EBCTCG pooled analysis examining long-term effects of adjuvant tamoxifen therapy.3 Similar to the EBCTCG’s report of an absolute reduction of 3.2% in CBC at 15 years, we saw absolute CBC reductions of 3.3% at 10 years and 4.0% at 15 years for at least 4 years of tamoxifen therapy vs no tamoxifen use among ER-positive patients surviving 5 years or longer. Also consistent with the EBCTCG’s pooled analysis, we found that tamoxifen therapy did not appear to lower the CBC incidence among women with ER-negative primary tumors, although our numbers were too small for precise evaluation. The agreement of our study with the EBCTCG’s report regarding the effectiveness of tamoxifen therapy strengthens the evidence for a long-lasting reduction in CBC risk both within and outside of the clinical trial setting. Just as tamoxifen use has been shown to be most effective among women whose initial diagnosis is ER positive in our study and other studies,9,12,23 tamoxifen therapy was particularly effective in reducing risk of ER-positive CBC. We and others12 have also shown that tamoxifen use does not seem to significantly affect risk of ER-negative CBC; however, these findings conflict with those from a prior nested case-control study9 that reported a 4.4-fold elevation in risk of ER-negative CBC (52 cases) associated with at least 5 years of adjuvant tamoxifen therapy. Although we had limited statistical power to evaluate risk of ER-negative CBC, the 95% CIs for tamoxifen-associated ER-negative CBC risk were not consistent with an increased risk of the magnitude reported previously. For decades, 5 years of tamoxifen use was the standard adjuvant therapy for patients with ER-positive tumors.24 More recently, AIs have represented an alternate therapeutic option for ER-positive postmenopausal patients.6,25 In the 10-year analysis of the Arimidex, Tamoxifen, Alone or in Combination (ATAC) trial,26 women randomized to receive anastrozole vs tamoxifen had significantly lower CBC risk. The recent introduction of AI therapy into clinical practice in our cohort precluded assessments of drug classes and the persistence of associations between varying AI therapy durations and CBC risk but will be the subject of future investigations. In the United States, most observational investigations evaluating the effect of tamoxifen therapy on CBC risk have been designed as cross-sectional7 or nested8,9 case-control studies. A major strength of our retrospective cohort study is that it was conducted within a large, prepaid health care plan that provided all aspects of care, including cancer treatment and provision of prescription medications. Furthermore, the cohort design allowed for absolute risk estimation, which is essential for clinical decision making. Despite these advantages, our study had several limitations. Because our study was observational, patients who used endocrine therapy for long durations may differ in some manner compared with never or short-term users. While we adjusted for multiple patient and clinical characteristics, the possibility of residual or unmeasured confounding exists. American Society of Clinical Oncology guidelines22 recommend that premenopausal or perimenopausal women who have hormone receptor–positive breast cancer should be offered adjuvant tamoxifen therapy. We could not fully evaluate this issue because we lacked data on the menopausal status in our cohort. Using age younger than 50 years as a proxy, we found that tamoxifen use was weakly associated with reduced CBC risk only among current and former users with less than 5 years since the last use. 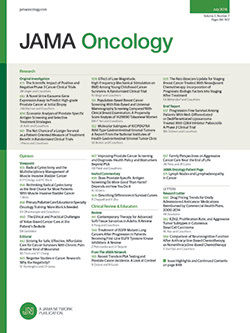 Current clinical guidelines recommend that postmenopausal women should be offered the choice of continuing tamoxifen use or switching to an AI for 10 years of adjuvant endocrine therapy.22 Therefore, despite the older age of our cohort, our findings demonstrating significant reductions in CBC risk with adjuvant tamoxifen (and AI) therapy are still relevant within the context of contemporary clinical guidelines. Earlier reports of reduced CBC risk in adjuvant tamoxifen trials motivated its evaluation as a preventive agent and drew attention to the importance of the contralateral breast as a risk marker.27,28 Therefore, our findings may have implications not only for women undergoing adjuvant therapy but also for breast cancer prevention. In a 2013 meta-analysis29 of tamoxifen prevention trials, breast cancer incidence was significantly reduced within the 5-year active treatment period and the first 5 years after stopping tamoxifen therapy. Our analysis of patients treated with adjuvant tamoxifen during a 20-year follow-up period might provide some clues as to the persistence of protection in the chemopreventive setting. The present is an opportune time for clinicians to engage in shared, informed decision making with patients regarding the best treatment course for breast cancer. If adjuvant endocrine therapy is indicated for breast cancer treatment, our findings in concert with trial data suggest that women should be encouraged to complete the full course. Corresponding Author: Gretchen L. Gierach, PhD, MPH, Metabolic Epidemiology Branch, Division of Cancer Epidemiology and Genetics, National Cancer Institute, National Institutes of Health, 9609 Medical Center Dr, Room 7-E108, Bethesda, MD 20892 (gierachg@mail.nih.gov). Accepted for Publication: June 24, 2016. Author Contributions: Drs Gierach and Berrington de Gonzalez had full access to all the data in the study and take responsibility for the integrity of the data and the accuracy of the data analysis. Study concept and design: Gierach, Glass, Berrington de Gonzalez. Drafting of the manuscript: Gierach, Curtis, Pfeiffer, Berrington de Gonzalez. Critical revision of the manuscript for important intellectual content: Gierach, Curtis, Mullooly, Ntowe, Hoover, Nyante, Spencer Feigelson, Glass, Berrington de Gonzalez. Statistical analysis: Curtis, Pfeiffer, Ntowe, Berrington de Gonzalez. Administrative, technical, or material support: Hoover, Glass. Study supervision: Gierach, Hoover, Spencer Feigelson, Glass, Berrington de Gonzalez. Funding/Support: This work was supported by the Intramural Research Program of the Division of Cancer Epidemiology and Genetics, National Cancer Institute, National Institutes of Health. Role of the Funder/Sponsor: The funding organization had no role in the study design; the collection, analysis, or interpretation of the data; the writing of the report; or the decision to submit the manuscript for publication. Additional Contributions: Brenda Rush, RN, and Kathy Pearson, BA (Kaiser Permanente Northwest Center for Health Research [Oregon]) and Maya Palakal, MS (National Cancer Institute) provided research assistance. Nikki Carrol, MS (Kaiser Permanente Institute for Health Research [Colorado]) provided data support. Jeremy Miller, BS, and Laura Bowen, BS (Information Management Systems, Rockville, Maryland) assisted with data support and analysis. Dale Preston, PhD (HiroSoft International Corporation, Seattle, Washington) provided statistical assistance. None received compensation outside of their usual salary.